Florjan Lipuš was born in 1937 in Lobnik near Bad Eisenkappel in the Austrian State of Carinthia. He went to the Upper Secondary School for the Humanities at the Plešivec/Tanzenberg Diocesan Seminary, which he graduated from in 1958. Afterwards, he studied Theology in Klagenfurt and later graduated from teachers’ college. He taught at bilingual primary-and-lower-secondary schools in Remšenik, Lepena, and Šentlipš near Ženek, until retiring in 1998. Florjan Lipuš is one of the main Slovene writers of prose fiction who also writes essays and dramatic texts. He published and edited the Mladje literary journal for 20 years (1960-1981). 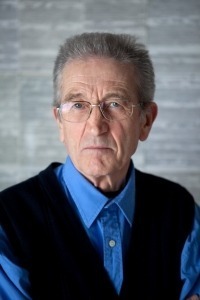 He was appointed Correspondent Member of the Slovenian Academy of Sciences (SAZU) in 1985 and has also been a member of the Slovene Writers’ Association for a number of years. He lives with his family in Sele near Žitara vas.